These Tiny Little Metal Dudes Make-A Me So Happy! One great thing Hasbro has been doing with its Marvel Movie tie-ins in the throwing the collectors a bone or two in the form of a comic-based line that goes alongside the movie time. This worked very well with the Wolverine: Origins product, and thankfully has been carried on with the toys for the upcoming Iron Man 2 film. 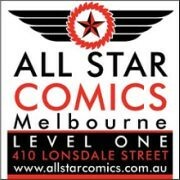 There are Movie, Comic and Concept Series in the 3 3/4" figure line, and they have now hit retail in Australia. I was killing some time while waiting for the youngest AFB-ette to get fully hyped up on sugar and slippery dips at a birthday party at one of those shopping centre play-gyms / parent torture centres last weekend and came across them at a Toys R Us adjacent to the centre, so I had to pick up a few. The big surprise of the whole gang is the greatly improved Classic Iron Man himself. I hadn't planned on buying this one, seeing as I already own the Marvel Universe and Secret Wars versions, but this one is a stand-out. The colours are more vibrant, the articulation more sturdy, and he "works" in a way that previous versions haven't. He comes with a power blast attachment which works very well, and a stand which is meant to be the blast from his feet, which has problems. He's pictured standing on this on the package with his feet right together, which is actually impossible, since there is only one peg and it's in the middle. He can only stand on this with one foot on the peg and one hanging off. Still works, but it's a but wonky. This doesn't take away from the fantastic figure. He may be a re-issue, but he's also a must have. Despite the greatly improved Classic Shellhead, Crimson Dynamo steals the series for me, and not just because it's the Soviet Super-Soldier's plastic premiere. He's not just a first-timer - he's extremely well done. In addition to being the perfect shade of... well, crimson, his armor is so well sculpted. He comes with an optic blast attachment that rests on his head a bit like a wreath, or a crown of purple plastic thorns. The only niggle here is that his feet are a bit oddly articulated which made him a bit hard to pose, but we got there in the end. Very happy to own this one! Comic Series War Machine is a fine piece with some interesting inclusions. A great feature here is his shoulder-mounted gun / blasty things, which have 360 degree rotation. The included plastic attachments show is that one is for zapping things, and the other is for.... popping popcorn? The only other drawback to War Machine's design is that his shoulder pads limit his arm movement somewhat. And did I mention his right hand blasty thing looks like popcorn? Pop! There's meant to be an Iron Monger in the Comic Series, but I picked up the Movie Series version while I was at it, because he looked cool. If the Comic Series version does appear, this one will get the boot, but he's a fun stand-in for the moment. You can see more pics at Facebook, discuss this at the AFB Forum, and comment on this post to enter the March AFB Comment of the Month Contest! ** Remember - this month only there's also a prize for one AFB Facebook Fan, so become one while there's still time! I finally found some of these at the local target tonight and picked up the classic IM, the original IM, War MAchine and Dynamo. I've yet to unpackage because of my current space restrictions, but they do look damned nice. Considering the stealth IM as well to avoid having to open the 3-pack set of DD, IM and Surfer. wohooo... these ones really worth while, i can see that they r quite detailed & the paint job with metallic finish r fantastic... this guys r not available in my country but i could consider to order them (after make some additions & subtractions OFC...)... something good is happening with 3 3/4" Hasbro figures !!! 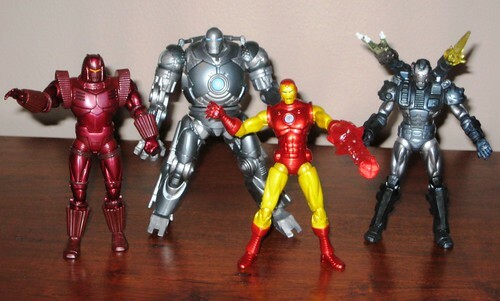 Glad to hear so many great reviews of Crimson Dynamo, I am planning on picking him up soon along with War Machine. Sooo many great figs in this line (granted there is a lack of variety compared to say XMO) but the sculpts are just so nice. 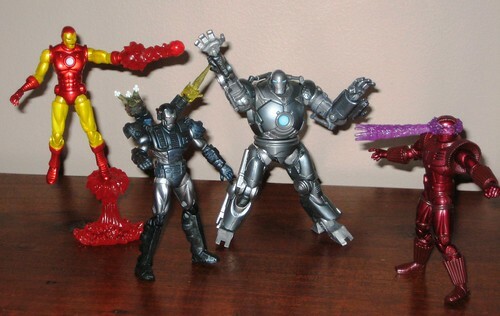 These figures are indeed quite good, and while I'm quite pleased with Comic Iron Man and Crimson Dynamo, I am returning the rest of the figures I bought, in favor of waiting for the 6" figures. DCUC Wave 5 is Coming Back on May 17th! A Bevy of Bowen Busts!